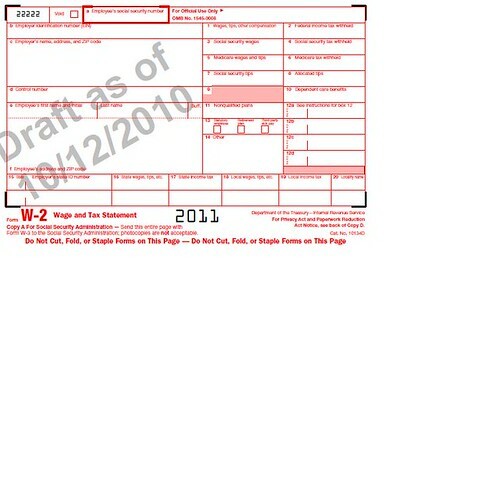 WASHINGTON — The IRS issued a draft Form W-2 for 2011, which employers use to report wages and employee tax withholding. The IRS also announced that it will defer the new requirement for employers to report the cost of coverage under an employer-sponsored group health plan, making that reporting by employers optional in 2011. This entry was posted in *AskTaxMama Newsletter, Employee Benefits, Health Insurance, IRS News, Payroll, Tax Forms, W-2, Wages and tagged Congress, Department of the Treasury, draft w-2, Draft_W2_2011, Government, health insurance, Health savings account, Internal Revenue Service, IRS tax forms, Labor, payroll systems, Taxation in the United States, United States, Washington.